Why Do Dogs Bury Bones in the Ground and How Do They Dig Them Up Later? 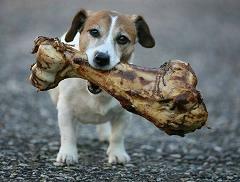 Dogs bury bones because it’s their version of a doggy bag, or a way to store food for later consumption. The act of burying bones and meat is an instinctual nature that has continued even though the dog has been domesticated. In the wild, canines like the fox, jackal, and wild dog are often left after the hunt with more food than they can consume at one sitting. Vultures and hyenas are more than willing to relieve them of their leftovers, some even before the pup is through eating. To save the energy of hunting again, they bury what’s left for the next meal. Sometimes a dog will remember where it buried leftovers, but if it doesn’t, it will use its keen sense of smell as an aid. What Happens To Pet Guinea Pigs After They Die and How Fast Do They Decompose When You Bury Them? How does an archaeologist or anthropologist know where to dig for artifacts and bones? Did the Ancient Egyptians make Cat Mummies and bury Artifacts to follow them in the Afterlife?